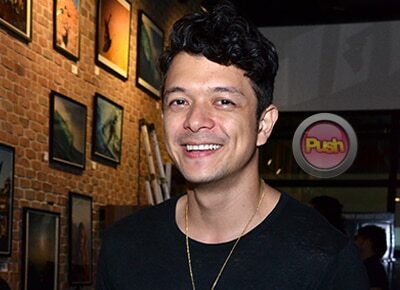 Jericho Rosales admitted that he was also surprised that his primetime project Maghanggang Wakas opposite Arci Muñoz took the second slot when it debuted this week. Magpahanggang Wakas took the earlier slot of Till I Met You, which stars Nadine Lustre and James Reid when it debuted this week. Till I Met You was then moved to the third slot, the same slot occupied by On The Wings of Love, after three weeks of occupying the second slot. In an exclusive interview with Jericho during his birthday party, he admitted that being in the second slot was something new to him. “Well, sanay na sanay nako sa third timeslot eh. Parang ‘yun na ang bahay ng mga teleserye na ginagawa ko dati eh,” he said. “It came as a surprise para sa aming lahat when we were moved to the second timeslot and for very good reasons,” continued Jericho. Jericho believes that there’s been a “careful decision” about such change. For his part, he admitted that a certain amount of pressure came to him now that he is in the second timeslot. “First time kong nakaramdam ng pressure in years parang ganon,” he described. Although he tries to calm himself down by thinking that he was placed in that timeslot for a good reason, he admitted that brushing off the pressure is proving to be difficult as of the moment. “Siyempre hindi mo pa rin maaalis na maiisip mo talaga ‘Oh my gosh, ang daming pressure dito sa timeslot na ito parang ganon.’ But you know I’m so happy because people love the story,” he said. Jericho shared that most of the tweets that he has received about their show lauded their storyline and his co-stars on the show. “I think they love the show. So confident kami sa part na ‘yun,” he said. Another thing that their fans lauded about the show were the scenic shots made by Direk FM Reyes of their location Caramoan in Camarines Sur as well as their steamy love scenes in the sea. “Actually ‘yun ang gusto ko sa kanilang dalawa eh, parang hindi sila magkasama together because of shallow reasons. They really love each other. Like intense love ang nararamdaman nila,” she said of his character Waldo and Arci’s character Aryann. He explains that those love scenes were included on the soap because they ought to be there. “Love scenes are part of the story to show how much they love each other but we’re not doing those things like for the wrong reasons. There’s so much more to the soap, to the series than just sa mga scenes,” he concluded.